Ten or so months into my HEMA journey is a drop in the ocean compared to many of the practitioners I admire, and yet it feels like much longer as it’s quickly become such a big part of my life. I’ve always been the type of person to dive headfirst into a hobby, then quickly get bored and move full-throttle into something else. Even to my own surprise, not this time. For a well thought out article about the impact HEMA has had on someone’s life – self image, general fitness, mental health – I’d recommend reading “I fight like a girl? 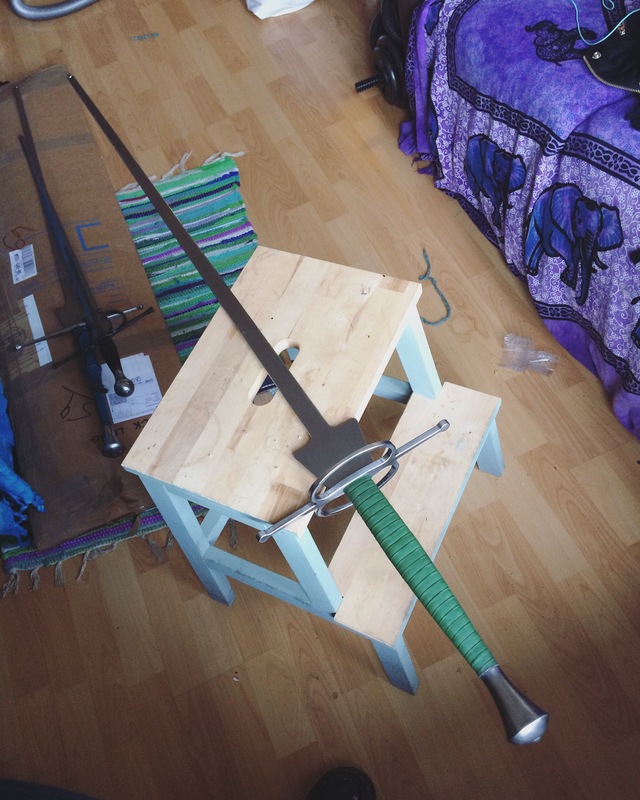 Tell it to my sword” written by a fellow female HEMA practitioner. My experiences are very similar to hers, and the idea of becoming a better fencer motivates me as much as the sheer fun of spending my Sunday evenings with swords. 2016 hasn’t been the best year, but looking back it hasn’t been as terrible as I thought it was at the time. I’ve made some great friends, had some great experiences, and actually made some pretty good decisions – most notably recognising the deterioration of my mental health at the beginning of the year and taking time away from university to get myself back on track. And, y’know, taking up sword fighting. I’ve done paid work in the field I hope to go into after graduation. I’ve travelled to and taken part in events for both HEMA and Steampunk and had a great time in both communities, and I’ve got plans to do even more in 2017. The year ahead is going to be full of changes and looks pretty daunting, but hey, I’ve got a sword. Bring it on.